Of the 3,000 species of cockroach proliferating throughout the world, you'll find only 50 in the United States. Cockroaches are known for adapting to their environment, and the habitats where you'll find them are as varied as their species. Some of the most common areas can be found in your home, your yard or even in the sewer. If you've ever flicked on a kitchen light at night and seen roaches scattering in every direction, you've no doubt seen the German brown cockroach (Blatella germanica). The roaches are less than 5/8-inch long, with a brown body bearing parallel black stripes. The roaches enjoy setting up nesting sites in minuscule cracks in your walls, under your refrigerator or other warm moist places in your home. They eat food particles, paper products and molted skins of other roaches. Wood roaches (Eurycotis floridana, Parcoblatta pennsylvanica) live outdoors in rotting logs, leaf litter and mulch piles throughout the United States. They seldom enter the home and usually don't survive long inside, as they are dependent upon the breeding conditions and forage found outside. A female brought into the home on firewood will attract males with her pheromones, so remove roaches and their bodies promptly from your home. Wood roaches eat decaying matter, as well as other small pests. The American cockroach (Periplaneta americana) can grow to as long as 3 inches, with antennae as long as the body itself. They are found throughout the southern portion of the U.S. in moist environments, proliferating in temperatures exceeding 75 degrees. 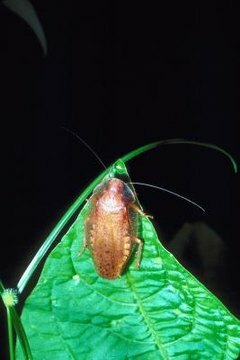 While the American cockroach prefers to forage outdoors, he has adapted to flourish in sewers, kitchens, bathrooms and commercial buildings where food and moisture are plentiful, including restaurants, boiler rooms and swimming facilities. Some roaches, like the Madagascar hissing cockroach (Gromphadorhina portentosa) are kept as pets, while smaller varieties are raised to provide food for reptiles and amphibians. Your roach habitat will need to be well sealed to prevent escape, and rubbing petroleum jelly around the top few inches of your habitat will deter attempts. Use peat moss or coconut fiber bedding, which can retain moisture without molding, and provide egg cartons or wood for hiding and breeding.